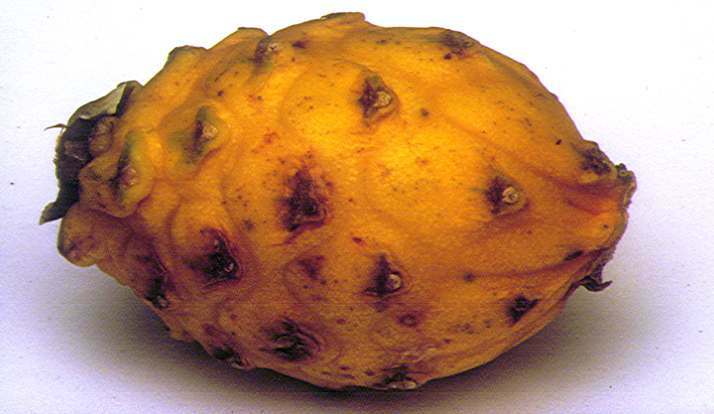 Many supermarkets in Great Britain and elsewhere sell exotic-looking rounded yellow, pink or red cactus fruit with prominent scales, similar to the one on the right, under the name of "dragon fruit" or "pitahaya". 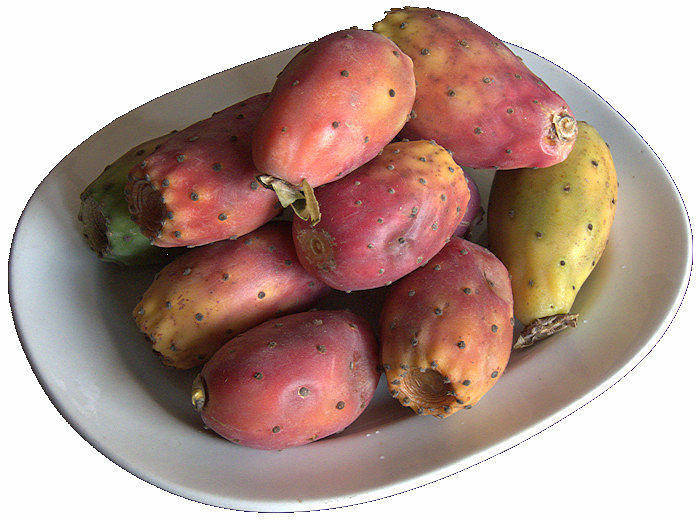 These succulent fruit are probably from cultivars of Selinicereus megalanthus (yellow skinned, white fleshed) or Hylocereus undatus (yellow, red or pink skinned, white or red fleshed). The fruit are quite nice and sweet to eat, although a little pricey and with no particularly distinctive flavour. They are said to be rich in Vitamin C and water soluble fibre. Dragon fruit are distinct from prickly pears which are from Opuntia (ficus-indica) and also can be quite tasty, but tend to be full of large, hard seeds. The best Opuntia fruit that I ever found were growing wild in the "Green Gulch" approach to the Big Bend National Park's Baisin; large, juicy fruit with aromatic purple flesh and not too many seeds. Slicing a dragon fruit in half reveals that the inedible rind contains a white-ish translucent flesh full of small black seeds. Some types of dragon fruit have a red flesh. To extract the seeds mash up a teaspoonful of the flesh in a little water and separate the seeds from the pulp. Remove as much of the pulp as possible as this could encourage growth of harmful fungi and damping off of the seedlings. 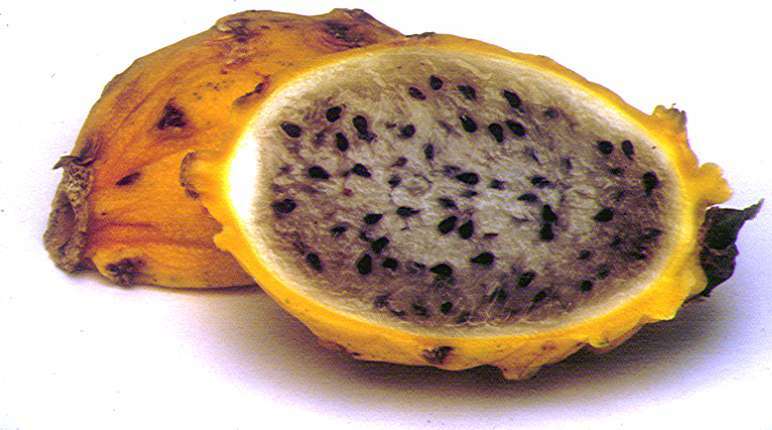 The seeds from a ripe dragon fruit grow very easily, so you don't need to use the whole fruit. A teaspoonful of fruit pulp is probably sufficient to extract enough seeds for an experiment. Sow the seeds in a gritty potting mix, water and cover the container or wrap in a polythene bag. A couple of weeks later the seedlings start to appear. This is a reminder that all cacti are true dicotyledons as the seedlings come up with two seed leaves, a bit like germinating beans. At this stage there is no evidence that they will develop into cacti, but these are the first and last leaves that will be produced. 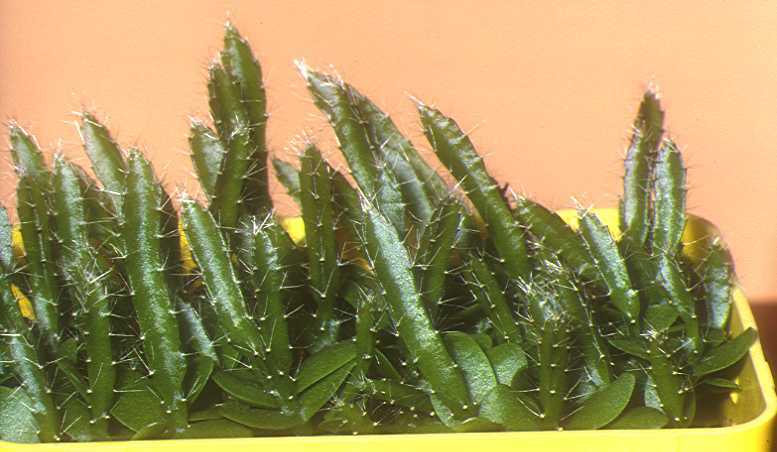 As the seedlings develop, an angular spiny succulent stem grows in the central growing point between the two leaves. The stem thickens and elongates and after several months the cotyledons shrivel and are shed. The seedlings can be potted on into individual pots and in principle could be grown on to a large plant and flowered to produce more fruit.